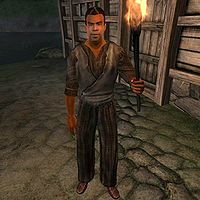 Armand Christophe is a Redguard pilgrim and one of the Doyens of the Thieves Guild working for the Gray Fox. As expected from a high ranking member of the Thieves Guild, Armand lives a secluded existence and spends most of the day inside his little shack located in the Waterfront District of the Imperial City. Like most other Guild members, he goes to bed early in the morning, sleeping from 6am until noon and always starts the day with a two-hour breakfast in the security of his house. Once he is full, he spends three hours strolling aimlessly around in the shack until 5pm, when he heads to The All-Saints Inn in the Temple District for a two-hour dinner. Once the sun starts to fade, he leaves the inn and returns to his shack for a bit of wandering until 11pm, when he walks down to the Garden of the Dareloth for the nightly meeting with two potential Thieves Guild recruits, Amusei and Methredhel. The three of them will patiently wait for another competitor to show up until 3am, when Armand returns to his shack and strolls around until his bedtime at 6am. On Loredas, he skips his dinner in the Temple District and instead secludes himself inside his house all day long, and only heads outside at 11pm for the nightly meeting in the Garden of Dareloth. On Sundas, after waking up, he immediately travels to the Market District, where he spends the next six hours roaming around, occasionally chatting with the other townsfolk. At 6pm he returns to his house, where he stays until it is time for the meeting at 11pm. There are a couple exceptions to this routine; see the Quest-Related Events section for details on the exception during the quest The Elven Maiden. The only other exception is that he will stay in his house while the curfew is being imposed in the Waterfront district during the quest Misdirection. At the end of The Ultimate Heist Armand will change his routine completely, and will, after waking up at 12pm as usual, enter the House of Dareloth, where he spends the next twelve hours wandering around the second floor and only takes a break at 5pm to have his two-hour dinner. When he is traveling around the big city, he wears a pair of coarse linens along with a leather cuirass and matching boots. However, when he feels safe he will swap his cuirass for a more comfortable coarse linen shirt and a pair of stitched leather shoes. He also carries an extra pair of huntsman leather pants as well as an un-enchanted, leveled mace, his torch, 12 lockpicks, and a key that grants him access to the Imperial Trading Company's dockside office and the two warehouses. The Waterfront Tax Records show that Armand pays 4 gold for his taxes. Before having joined the Guild, you may hear him say to other citizens: "I'm not sure I can trust you. Why don't you just move along." To citizens he likes, he says: "You look like someone I might be able to help." When approached by the player, he may say: "I don't like the look of you. Keep moving." if he disposition is low, and once he likes you he will say: "Psst. Over here." When you engage him in conversation for the first time, he will be rather rude: "Do I know you?". Subsequently he will say: "I really don't have time for the likes of you. ", and finally "Oh. You Again." The only information you will get from him are a few words of advice about life in the city: "A little tip. People who ask a lot of questions around here tend to be not very popular." If you ask him about the Gray Fox, he will reply, "He's just a name on a wanted poster. I don't trust you enough to say more than that." He will always close the conversation with a premonition: "Somehow I think we will meet again." After you ask to join the Thieves Guild, he will proceed to explain the task that Methredhel, Amusei and you need to accomplish in order to be accepted into the Guild: "Everyone is here, let's begin." "Each of you is seeking membership in the Thieves Guild. The Thieves Guild is not a myth. We are followers of the Gray Fox, and I am his Doyen. Merely by finding me, you have passed the first test. It's unusual for us to have three potential recruits at the same time. Rather than the normal test of skill, I'm going to make this a contest. Methredhel, you know the rules. However, for Amusei and the newcomer, let me state them clearly. Whoever brings me the diary of Amantius Allectus, without killing him, will be invited into the guild. It's somewhere in the Imperial City. The beggars will help you locate it, for a price. I can sell you lockpicks if you need them. One more thing. You cannot kill each other during this trial. We may be thieves, but we're not murderers." During the challenge, if you speak to Armand once you have already found the location of Amantius Allectus' house from beggars, asking about the Gray Fox away from the garden will now yield the following reply: "This is neither the time nor the place." You also now buy lockpicks from him for 5 septims. If you have the money, he will give them to you, saying: "Here you go." Lacking the change, he will tell you: "You don't have enough coin to buy one." Going to speak to him at Dareloth while neither you nor he has the diary, if you ask him about the challenge, he will dismiss you: "You don't have the diary. Stop wasting my time!" He will also now say goodbye to you with: "Now get out of here." If you are successful in turning in the diary of Amantius Allectus, he will be thrilled and immediately give you membership in the Guild: "Congratulations! You have returned with the diary. You have earned the right to join the Thieves Guild. You now owe your loyalty to our guildmaster, the Gray Fox. He has three rules you must follow." Armand will proceed to explain you the rules of the Guild: "First, never steal from another member of the guild. Second, never kill anyone on the job. This is not the Dark Brotherhood. Animals and monsters can be slain if necessary. Third, don't steal from the poor. The peasants and beggars are under the personal protection of the Gray Fox, particularly here on the Waterfront." At this point, many dialogue options will open, and Armand has quite a bit of information for the curious player (see below). If you killed Amantius and have his diary, he will say: "Congratulations! You have returned with the diary. Unfortunately, you were stupid enough to kill Amantius Allectus in the process! Now you must pay his blood price to enter the guild. However, because you are not yet a member, it is only half of what it would normally be." If the Bosmer, Methredhel, beats you in returning the diary, Armand will accept it from her and say: "Methredhel, you have earned the right to join the Thieves Guild." He will greet you with: "So, you've come back." He will reveal that he is however willing to give you another chance to gain entry into the Guild, explaining that to achieve this you need to steal a blade from the local smith, Rohssan: "Methredhel has delivered the diary to me. She has earned her place in the guild. You did not do so well. Since we rarely get three potential recuits at the same time, I'll give you one more shot. Amusei is a bungler and won't get this offer. The first one to bring back Rohssan's sword will become a member. But, this is the last chance. The loser gets nothing. Do you accept?" If you reject the offer, he will say: "You walk a dangerous path. Keep the secret of the guild... or else. If you change your mind, I'll be here." If you accept the challenge, he will be happy: "Good. Remember, you may not kill anyone while doing this. If you need any lock picks, I can sell you some." After you have retrieved the sword, he will proceed to proclaim you a Pickpocket in the Thieves Guild: "It took two tries, but you finally made it. You have earned the right to join the Thieves Guild. You now owe your loyalty to our guildmaster, the Gray Fox. He has three rules you must follow." He will then read you the rules. If you have killed Rohssan, he will say: "Well, you finally returned with Rohssan's sword. Unfortunately, you were stupid enough to kill Rohssan in the process! Now you must pay her blood price to enter the guild. However, because you are not yet a member, it is only half of what it would normally be." Asking Armand about your blood price, he will ask you: "Are you prepared to pay the blood price you owe?" If you have the money, he will say: "Your generosity restores your honor within the guild. You may now seek membership. As a new member, you now owe your loyalty to our guildmaster, the Gray Fox. He has three rules you must follow." He will then read you the rules. If you don't pay off your blood price, he will say: "We should not speak of this again until you can pay the blood price." Once you are accepted into the guild, he will now bid you farewell with: "Shadow hide you, Pickpocket." He will also now greet you with: "Ah! Our newest member." the first time he sees you, and "Can I help you, Pickpocket?" thereafter until you complete the following quest. Before you have fenced 50 gold worth of stolen goods, he won't talk to you about the next quest: "You need more experience before I can use you on a commission job. Ongar tells me that you haven't turned in much loot yet. When you've contributed enough to the guild coffers by selling stolen items to Ongar, I might have something for you. Come back then." Speaking to Armand away from the Garden of Dareloth, he will greet you with: "I might have something for you, but we can't talk about it here. Meet me at the usual place, and at the usual time." Inquiring further, he will be annoyed: "Maybe I wasn't clear before. You only talk business with me in the Garden of Dareloth around midnight." After you have fenced enough stolen goods to Ongar the World-Weary in Bruma, you may speak to Armand about the job he has. He will greet you: "I'm glad you stopped by. I have a... situation that you might be able to help with." He will inform you that recently the bothersome Hieronymus Lex collected taxes from the people inhabiting the Waterfront, and he will request you to retrieve these taxes to teach the Imperial Watch a lesson: "The Gray Fox has asked me to take care of a problem, and I'm putting you on it. Hieronymus Lex actually collected taxes from everyone living here on the Waterfront! Your job is to recover those taxes." If you say that seems noble for thieves, he says: "The people of the waterfront are very poor. Traditionally the city has not collected taxes from them, even though by law they could. The money the city would collect would barely cover the cost of collecting. The Gray Fox has always guaranteed protection to the poor of the waterfront. He doesn't want to let this injustice stand. It's a matter of principle." Inquiring why the Gray Fox even cares, he will respond: "The Gray Fox has led our guild for over 300 years now. He has always guaranteed protection to the poor of the waterfront." Asking about Lex, he says: "He is a fool of a Captain in the Imperial Watch. He's a real law and order type. He has a grudge against the Thieves Guild and the Gray Fox in particular. Lex has made it his personal mission to capture him. The Gray Fox has led our guild for over 300 years now. He has always guaranteed protection to the poor of the waterfront." If you reject the job, Armand will say: "I suppose it can wait for a while. Let me know if you change your mind." Accepting the job, he will say: "Good. Find out where he's keeping the taxes and bring them to me. I'll also need the tax records of what each citizen paid so we can return it." Speaking to Armand after this will have him greet you: "Have you recovered those taxes?" If you do not have them, he will say to you: "Let me know when you have the money and the tax records". Once you have returned with the tax records, Armand will happily take them from you: "Ah! The Gray Fox will be very pleased. We will make sure this gets back to the people. Can you believe that fool even bothered to collect this paltry sum? You can keep it. I merely wanted the Watch to know they went too far. I think its [sic] time to promote you to Footpad. Congratulations on your new guild rank. ", proceeding to promote you to the rank of Footpad. If you killed someone on your way to getting the tax records, he will say: "It seems you got carried away and killed someone. We do not condone murder in the Thieves Guild. You are no longer a Thieves Guild member until you pay the blood price. Guild tradition holds that you must pay it for each person slain." If you decide not to pay your blood price, he will say: "Then get out of my sight until you do." After paying off your blood price, he will say: "You have restored your honor within the Thieves Guild. Now I can pay you for your recovering the taxes and promote you to the rank of Footpad. We will make sure each person on these tax rolls gets their money back. Can you believe that fool even bothered to collect this paltry sum? You can keep it. I merely wanted the Watch know they went too far." He will now greet you with: "Good to see you again!" If you try to receive your new orders away from the Garden of Dareloth, Armand will tell you: "You know better than to contact me here. Meet me at the usual place. Dareloth's Garden, at midnight." If you try to take the quest before you have fenced stolen goods worth at least 100 gold, Armand will reject you: "I do have need of a skilled operative. Perhaps if you were to get more experience I could use you. The fences report to me how much loot you have turned over to them. When you've added more to the guild coffers, come back and see me." Once you have fenced enough, Armand will request you to carry out a special arrangement the next time you speak with him at the Garden of Dareloth: "The Guild has received a 'request' to obtain a unique statuette. It is a bust of Llathasa Indarys, the recently slain Countess of Cheydinhal. You will be paid a modest sum. Do you want this job?" If you reject the offer, he will say: "That's unfortunate. Let me know if you change your mind." Accepting the quest, he will conclude briefly by saying: "Excellent. Bring it back to me once you have it." However, as you may find out once you have returned to the Waterfront with the bust in your inventory, it will be crowded with several Imperial Legion Watch soldiers running around the Waterfront searching for Armand. The other newest member of the guild, Methredhel, will inform you that he is hiding out (he is in an Imperial Trading Company Warehouse basement). If you try to return the bust to Armand directly, he may say: "What are you doing here?" Engaging him in dialogue, he will greet you with: "I'm in hiding from the Imperial Watch. Go find Methredhel. She has your instructions." Speaking to him about the bust: "It's not safe for me to handle the bust. I shouldn't even be talking to you. Go find Methredhel. She has your instructions." After you have exposed the spy to the Imperial Watch, Armand will resume his normal schedule. Once you speak with him he will now say hello with: "You're a welcome sight." He will reveal his true intentions if you engage him in conversation: "With your help I uncovered the informant that had compromised the Thieves Guild. I know I used you in this matter with the Llathasa's bust, but I couldn't be certain that you weren't working with Myvryna. Here is the reward you were promised. Even though the bust is gone, you've earned it. I'm also promoting you to the guild rank of Bandit, which will let you use Dar Jee of Leyawiin as your fence. Good work!" If you killed someone while trying to get the bust, he will say: "Well, you managed to get Llathasa's bust, and you got Hieronymus Lex off my back. However, you broke the code of the Thieves Guild. You killed someone in the Chapel, and now you have to pay the blood price. Until you do, you are no longer a member of this guild. Don't bother to come back until you have it." Speaking to him about the blood price, he will say: "Are you ready to pay the blood price for the murders you committed in Cheydinhal's Chapel?" If you choose to pay, he will say: "You have restored your honor and that of the Thieves Guild. I can now officially pay you for your efforts and promote you to the rank of Bandit." He will now greet you with: "You've done well for yourself." However, as he will explain when you ask him for another special commission, he won't give you any further jobs as you have now achieved the rank of Bandit: "Sadly, I don't have anything for you. I only work with the less experienced guild members. You should go see S'Krivva in Bravil from now on. You can find her at the Lonely Suitor lodge. I wouldn't recommend bothering her at home, unless the door is unlocked." If you ask for a reminder about where S'Krivva is after this, he will be irritated: "Are you deaf? Didn't I already tell you that she is in Bravil?" Armand also handles the blood prices associated with the three Thieves Guild quests Turning a Blind Eye, Arrow of Extrication and Boots of Springheel Jak. For Turning a Blind Eye, if you refuse to pay the blood price, he will say: "Then it is time for you to leave." For Arrow of Extrication, he will say: "Then get out of here until you can." For Boots of Springheel Jak, he will say: "Then begone." When you do pay off your blood price, he will say, respectively for the three quests: "I accept this blood price and welcome you back into the Thieves Guild. I oughta break your neck though. Don't make this a habit. ", "It's about time. I guess I have to reinstate you now. Try not to repeat this mistake in the future. I am now allowed to grant you a promotion to Master Thief. Congratulations, I suppose. Be ready if the Gray Fox should need you again." and finally, "This will help to erase the stain on the Thieves Guild. Here is the reward the Gray Fox promised you for fetching those boots." If you get cast out of the Thieves Guild for whatever reason, you will need to find either him or S'Krivva to be reinstated. If you ask him about it, he will say: "You have been cast out for mistreating your fellow Thieves Guild members. In order to be returned to the rolls you must make reparations. Are you ready to pay the fine?" If you refuse or cannot pay, he will say: "Then I have no use for you. Begone until you can pay the fine." If you do shore up the money, he will say: "Excellent! The guild accepts your... apology and welcomes you back into the fold." He will then take your money and you will be back in the guild. As a doyen of the Thieves Guild, Armand has quite of bit of information to tell the player if asked. If you ask him about his role in the Guild, he will reply: "The Doyen are the hands and eyes of the guildmaster. You take your orders from them. You get your favors from them. I am one Doyen and S'krivva is the other." Asking about sources of information, he will refer you to the beggars: "The best source of information are the beggars. Their eyes and ears seem to be everywhere. However, be prepared to spend a little coin. They won't tell you anything for free. At least not anything true." Should you seek to pay off a bounty, he will say: "You can pay your fines to the guards, serve your time, or pay me half and I'll fix them all." Choosing not to pay him for it will yield the response: "It's your prison sentence, not mine." If you do decide to pay, he will say: "Consider it done. I will get rid of all your criminal warrants." Inquiring about the consequences of stealing from a fellow guild member, "You are removed from the guild. You must pay a fine to one of the guild Doyen to get back in." Also, the consequences of killing someone: "Breaking any of the three rules means expulsion from the Thieves Guild. If you commit murder, you must pay the blood price to rejoin the guild. Blood price is for each person slain. You can pay any of the guild Doyen." Asking him about jobs to do, he will tell you: "Jobs? We're thieves, not masons or scribes. Look, you're on your own as a thief. Go find a likely looking house. Case the joint to see when the owner is gone. When he leaves, you break in and steal some stuff. You don't need special permission or orders to do that. However, you will find that you can only sell stolen property to one of our guild fences. Most other merchants won't take hot merchandise." Asking about special jobs will have him respond: "Well, sometimes the guild gets a special commission. You know. Guaranteed pay to 'acquire' certain items for special clients. You should check in with your Doyen every once in a while to see if there are any commission jobs available." When you ask him about fences in the Guild, he will say: "The best fences are only available to the higher rank Thieves Guild members. Here's a list of who you can use." Asking about Ongar, he will say: "Ongar lives in Bruma. He doesn't have much money, but he's the only place you can sell hot property if you are new to the Thieves Guild." Once you have access to the other fences, he will have some information on each of them. For Dar Jee, "Dar Jee lives in Leyawiin. He doesn't have much money, but he's got more than Ongar." For Luciana Galena, "Luciana lives in Bravil. She is a decent fence. Better than Ongar and Dar Jee at least." For Orrin, "Orrin is a respectable fence, if there is such a thing. He's got a decent amount of gold, but is a tough negotiator. Go to him instead of Luciana." Finally, for Fathis Ules, "He is the best fence in the Thieves Guild. He operates from the Elven Gardens in the Imperial City." Once you have completed the Thieves Guild quest line, he will say about Fathis: "He is the best fence in the Thieves Guild. He spends time in the guild hall, and in the Elven Gardens." Before you have completed the quest Taking Care of Lex, if you ask about Lex he will tell you: "He's a Captain of the Imperial Watch. He is pursuing a personal vendetta against the Thieves Guild and the Gray Fox. Two years ago I made a fool out of him when he tried to arrest me. Lex has never forgotten it." Once you can ask him about Nocturnal, he will say: "You're kidding. Everybody knows Nocturnal. She is the daedra lord of shadows. The Mistress of Mystery. The Saint of Suspicion. Thieves Guild members revere and respect her power and influence. We give her blessing with the phrase 'may shadow hide you.'" While at the meeting at the Garden of Dareloth, Amusei and Methredhel will both hint at Armand's high up position in the Guild. Amusei says: "You wish to join the Thieves Guild too? Maybe we will soon be brothers in the shadow. Only Armand can say." Methredhel will say: "So you are looking for the Thieves Guild as well. Armand Christophe will decide who is worthy and who is not. I've been preparing to join the guild for years. If you're nice to me, maybe I'll show you a few tricks." Once you are a member of the Guild, if you ask a member about doyen, they will direct you to Armand: "The Doyen are the hands and eyes of the guildmaster. You take your orders from them. You get your favors from them. The current Doyen are Armand Christophe and S'krivva." If you ask about paying off your bounty, they will say: "Armand Christophe and S'krivva have special arrangements with the guards and judges throughout Cyrodiil. They can make all your outstanding warrants go away, for only half the price of the fines." If you have been cast out, they will say: "I heard what you did. So did the guild Doyens. You've been cast out of the Thieves Guild. Go talk to Armand or S'krivva. Pay the fine and you'll be reinstated." While Armand is in hiding during The Elven Maiden, Thieves Guild members will direct you to Methredhel if you ask about Armand: "He's in hiding. I hear Methredhel is looking for you, though." Methredhel herself will elaborate: "He is in hiding. Armand is accused of stealing the bust of Llathasa Indarys from Cheyhindal. They say Count Indarys himself filed the charges." In the Waterfront, you may hear Hieronymus Lex encourage his troops: "Keep looking boys. Armand Christophe has to be here somewhere." The guards may be heard reporting in to Lex: "No sign of Armand Christophe, Sir." or talking amongst themselves, saying: "Any sign of Armand Christophe? ", "Can you tell me where Armand Christophe is hiding? ", or "Have you seen Armand Christophe?" At the beginning of Misdirection, Methredhel will mention Armand's predicament: "These are foul times for us. Armand is under house arrest, again. Our business in the Waterfront is totally shut down. We need to get Hieronymus Lex to lift his siege. I have put together a plan." Before you complete Taking Care of Lex, Imperial City citizens will have this to say if you ask about Lex: "He is captain of the Imperial Watch. He is pursuing a personal vendetta against the Thieves Guild and the Gray Fox. I heard the Gray Fox personally humiliated Lex years ago when he tried to arrest Armand Christophe for theft. Lex has never forgotten it." Esta página foi modificada pela última vez à(s) 13h13min de 3 de outubro de 2015.